Case concerning sovereignty over Abundantia Ridge and other matters. From 16 - 18 April 2009 the 32nd Telders International Law Moot Court Competition will be held at the Peace Palace in The Hague. The Telders Moot Court Competition could be considered the most prestigious and important international moot court competition in Europe.The Telders Moot Court Competition is named after Professor dr. Benjamin Marius Telders, who first became a professor of international law at Leiden University in 1931. In 1947, former students of Professor Telders founded the Telders Society for International Law (Telders Dispuut). The first Telders International Law Moot Court Competition was organised in 1977 on the occasion of the 30th anniversary of the Telders Society for International Law. The Competition has been held annually ever since. The student teams, composed of 4 students each, have to defend two States which are in a fictitious dispute. Only the student teams from the universities that have won the national rounds will participate in the Moot Court Competition held in The Hague. The fictitious case is put before a Moot Court version of the International Court of Justice of the United Nations. The memorials and oral argumentations of all teams representing the two fictitious States are judged by legal experts such as Judges from the International Court of Justice, the Iran-United States Claims Tribunal and prominent academics and jurists specialized in public international law. “The Mare Liberum Case. Case concerning sovereignty over Abundantia Ridge and other matters. 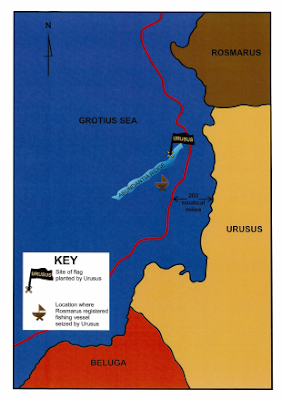 Rosmarus v Urusus”. You can find the complete 2009 Telders Case at the website of the Telders Moot Court Competition . For clarifications of the Mare Liberum Case look here and for a map of the two States and the Grotius Sea go here. - Or systematic code search: 160p. - Or systematic code search: 9g. - Or systematic code search: 160p (international law) and 368a1 * for municipal environmental law (368a1 * followed by country in French, E.g. 368a1 France). - Or systematic code search: 97p and 160p. - Systematic code search: 96, 97p and 160p. -Or systematic code search: 97p and 145. - Or systematic code search: 96. - Or systematic code search: 145. - Or systematic code search: 97f. - Or systematic code search: 97a. - or systematic code search: 96a. - Or systematic code search: 98. - Or systematic code search: 131.